Hydrocarbon Processing's Global Refining Map provides a comprehensive overview of hydrocarbon processing facilities around the globe. 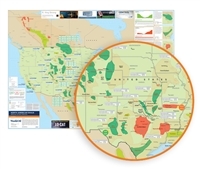 Scoop/Stack Map is published by World Oil. Oklahoma's Anadarko basin has become second only to the Permian basin as a popular and prolific area of shale activity in the U.S., courtesy of two specific plays. The SCOOP (South Central Oklahoma Oil Province) play has seen interest skyrocket since 2012, when Continental Resources first looked for oil-based resources adjacent to its Woodford gas holdings. The STACK (Sooner Trend Anadarko Basin Canadian and Kingfisher Counties) play, like the SCOOP, is not new. Yet, it has been revitalized by horizontal drilling and hydraulic fracturing. World Oil's Permian Basin Map published in December 2018. The Permian basin of West Texas is currently the largest concentration of new drilling activity in the United States. World Oil's Eagle Ford map published in March 2019. Often referred to as the little brother of the Permian basin, the Eagle Ford shale came of age during the five-year U.S. unconventional boom of 2010-2014. Operators were lured to plentiful reserves of oil, gas and condensate. The rapid development and oil production growth, accompanied by traffic snarls and a worker housing shortage, came to a grinding halt at the end of 2014, when the oil price crashed.